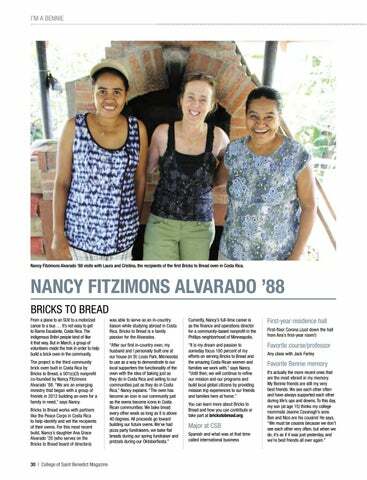 Nancy Fitzimons Alvarado ’88 visits with Laura and Cristina, the recipients of the first Bricks to Bread oven in Costa Rica. was able to serve as an in-country liaison while studying abroad in Costa Rica. Bricks to Bread is a family passion for the Alvarados. Currently, Nancy’s full-time career is as the finance and operations director for a community-based nonprofit in the Phillips neighborhood of Minneapolis. You can learn more about Bricks to Bread and how you can contribute or take part at brickstobread.org. 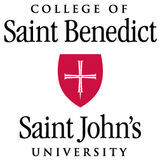 Saint Benedict’s Magazine is published three times a year by the Office of Institutional Advancement.